Here's our first update from Elizabeth Pease : "Ellen Putzier and I met some ladies from Zambia in town for the conference while shopping this afternoon. They said that everyone from Zambia came as a big group together. They had special fabric printed for the anniversary and made dresses - you can see the backs of a few people wearing it in the photo. 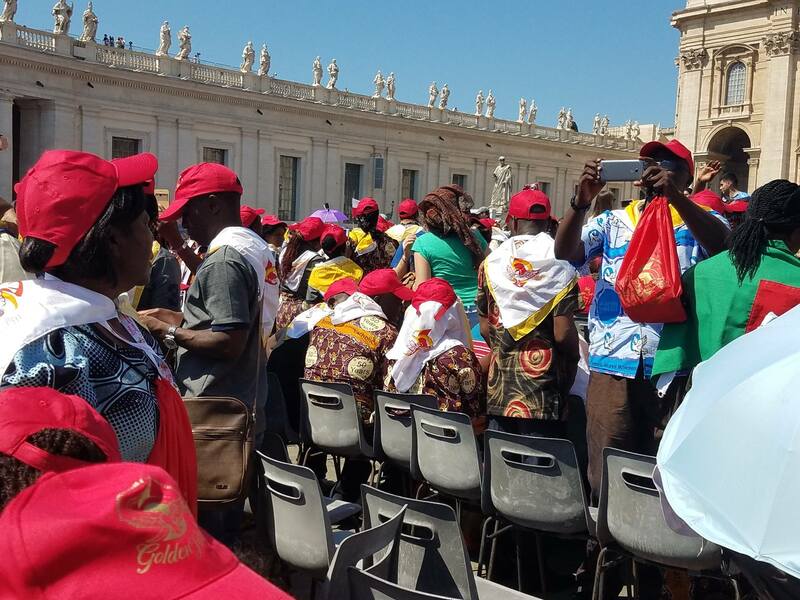 They said that not all Catholics in Zambia are charismatic, so they don't always raise their hands in church, but when there's a charismatic mass, oh boy, that's exciting." The red baseball hats were included in the conference registration kits, along with yellow bandanas, and there are "tons of people wearing them."